In this episode of The Amazing Seller Podcast I’ll explain how I plan to start collecting my customer email addresses using insert cards. It’s still not clear if this is within the TOS within Amazon, but I think as long as I’m adding value, it shouldn’t be a problem. Keep in mind that Amazon has not said yes or no to this, so use your own judgment. One of the reasons I’m collecting these emails is to have the option to reach out to my past customers when I launch new products. This will give me a HUGE advantage to help get sales going and spike my BSR. It will also help get some initial reviews, which is another BIG advantage and is why I also use My Feedback + Review Technique. The other reason is to allow me to build a customer list, just in case something happens within Amazon and my seller’s account. You never want to depend on a channel you don’t control. By having this list I can always push people to whatever store or channel I want. It’s an asset that will give my business huge leverage. 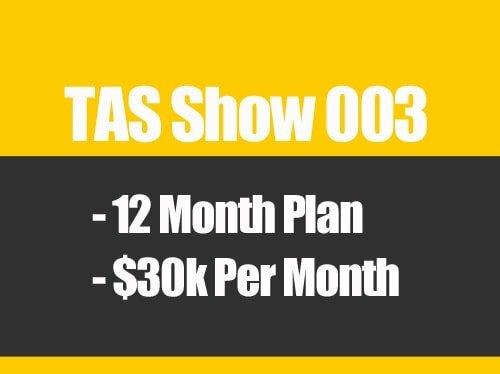 In the show I discuss my current flow or funnel as they call it in the marketing world, and how it all fits together. Here’s an image of how it fits together and the process looks. 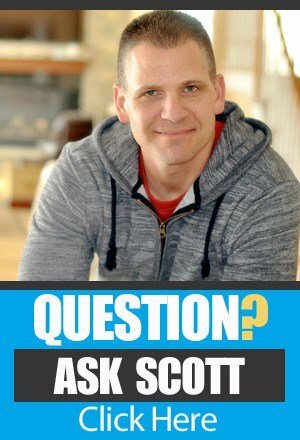 If you have any questions from the episode or another topic…click ASK SCOTT HERE! 1. Are you still implementing this strategy (product insert card has URL leading to email capture landing page) with your new products that you’ve launched in 2017? 2. When directing from insert card to email capture landing page – does your incentive to the customer for registering always include a “warranty”? What I’m wondering is if in your opinion, to stay as safe as possible in this grey areas with AMZ, do you always include a “warranty” or are you sometimes not offering a “warranty” at all and just offering other incentives such as a valuable “user guide” or a “how-to-do guide” (ect)? Hey Joe, you can use a variety of incentives it doesn’t have to be a warranty. You can absolutely include an insert card and we do in many of our products. hi, Scott! great stuffs as always. 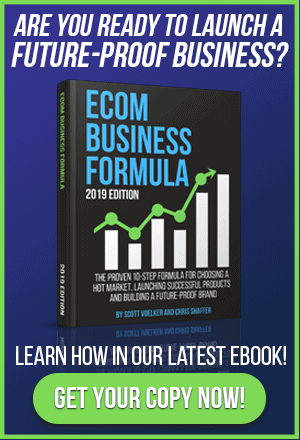 You are the go-to-source for amazon sellers indeed and your impact is tremendous! thanks for that. We have a shopify site. Do you still recommend us use leadpage and aweber to collect email addresses from amazon buyers? We installed the apps to collect email addresses of the visitors anyway but the messages for amazon buyers are different obviously. What do you recommend? I have been researching for days and speaking to support staffs of different apps but didn’t get the answer. hope you can shed us the light! Hey YT leadpages and aweber will work, my go to now is clickfunnels and convertkit just because of the features they have. Hi Scott, I was in the process of launching my first 2 products. As a result of the new seller ban i am fine tuning things. I just wanted to know if all the info in this episode is still relevant for launches now? And if it is, if I am launching 2 different products, should I do this whole sequence twice so everything is separate or can I use the same Landing page for both my products and just make them more generic, what would you do? Also for the email lists, would you recommend creating a giant list for all our products, or a different email list for every product? Also the 4 email sequence in Ep 10 is different to what you are talking about in this yes? You can use a-webber for the email sequence to no? Let me know. Thank you for your time. Hey Adam, you would want to do the email sequence separately for each product. 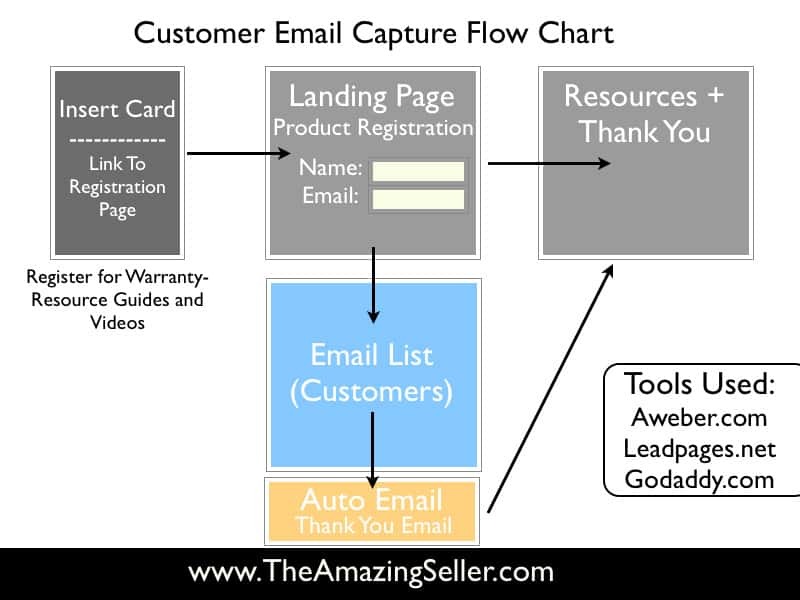 Yes, the email sequence in episode 10 has to do with follow up for Amazon buyers, the other list would be your OWN list. I would like to ask if we should not provide our email address to the customer or divert customer away from Amazon with an external website of our own ? Hey Chris, you can’t use Amazon to direct traffic to your own site. Using something like an insert card to collect emails wouldn’t generally be a TOS violation because the transaction is over already AND you’re not (or at least shouldn’t be) sending them an insert card that says DONT BUY ON AMAZON BUY FROM ME. You’re giving the customer additional value in exchange for their email, nothing wrong with that. First off, thank you for all you do. You’re podcasts helped me get my Amazon business off the ground and I’m now self employed and loving life. Quick question regarding customer lists: Would you recommend using a bitly redirect link on product inserts or just your website link? I don’t want to step on Amazon’s toes, but I also don’t want to confuse my customers. Hi Scott. Thanks for all the great informations about selling products on Amazon. We’re in the process of creating an insert card right now and I just wondered if it’s okay to use our website as the URL with an special sub-site or if we need to create a new domain? Hey Lara, you could point a domain to your landing page or just put the direct page on there (e.g. xyz.com/landingpage). As this podcast was done nearly a year ago now, I just wanted to know if your current stance on inserts has changed at all with all the newer TOC’s etc? We use card inserts for one of our products with link to activate warranty at our website but with our other product it is a bottle so we are unable to use an insert so have the link on the reverse label of the bottle instead. It reads like: Join our VIP club & activate your guarantee at http://www.ourwebsite.com. After reading some info on the TAS FB group there is conflicting info as to what is OK so I just wanted to get your opinion as a little worried as to whether we have gone the right way about it now? Many thanks in advance. Thank you so much for this great stuff! We will try this system for our product. •Landing Page = Registration Page -> Thank you Page? Is your landing page (let’s say http://www.garlicpress-vip.com) already the registration page where people can immediately enter their email address? •Landing Page -> Registration Page -> Thank you Page? Does your landing page forward people to the registration page? I have been listening to your newest podcast 155 a few minutes ago. You rock! Hi Scott, Great stuff very helpful! I’m just curious how much success you have had using the insert card method, any idea what your sign up rate is? Also, do you also have the product disclaimer/warnings on the same card? You can absolutely add the warning/disclaimer to the same card. Signup rate is in the low single percents but varies by product. Your list won’t grow overnight, but every little bit helps! Can you explain how the URLs/domains get setup with leadpages? I want to include a URL in the insert card to capture email addresses, but not sure what to include? Hey Mike, your exact setup would depend on what you’re doing, but at its most basic, you can just use the leadpages link. If you’re using something like a wordpress site, you can install the leadpages plugin and use a “real” url like theamazingseller.com/webinar. At the VERY beginning, would there be anything wrong with just simply inviting customers (on my insert) to email me with the word WARRANTY in the subject line so I hook them up with a 1 year warranty? Then I’ll have their email address. True, they’ll have mine but I can’t imagine I’ll be inundated at the beginning. Then I don’t have to pay for aweber, Leadpages, etc. when I may have very few responses. Any thoughts? I don’t know that there would be any issues there per se. The issue you may run into would be spam compliance. You would have to manually keep a record of every person and how “opted in” to you they are. With all of the laws around email compliance, your best bet is usually to utilize a mailing service like MailChimp (free to get started) or Aweber. That way you limit your risk and still get all of the benefit! Thanks Scott – just to clarify, though, aren’t Mailchimp and Aweber tools for me use to email the customer? Those ARE the tools I would use once I have a promotion to let customers know about. I’m talking about how to gather the email addresses in the first place as cheaply and simply as possible. As far as I can tell, gathering email addresses doesn’t demand much in the way of opt-in. It’s only when I USE the email address (which is where Mailchimp and aWeber come in) that opt-in becomes important. Am I right? Hey Russ, in order to be on the up and up, you’re better off collecting the email address using a platform that is compliant with Can-Spam. This not only ensures that you’re in full compliance with the law, but it eliminates headaches that might come from storing a list outside of those types of platforms (like security). Additionally, it’s becoming more and more difficult (and it should be) to import lists that weren’t collected via an official opt-in into these types of platforms. Your best bet is to use something like mailchimp (FREE) to do that. They will provide you with the forms you need to capture the addresses properly and you can go from there. What happens if a customer buys a second product a month later and wants it registered too? They will be informed that the email is already “subscribed-registered” right? Because what you basically do is building an email subscription list in aweber. Depending on how you set it up, that would be the case. If the customer has any questions about why they can’t register again, chances are they will reach out to you and you can just let them know that you have their email in case either of their products have an issue. Oh and you should probably thank them for being such a loyal customer as well! Great info! Do you know the actual policy on including inserts in the manufacturer’s packaging? I know you can’t do it if you are not the manufacturer and you just including it in the package or poly bag somehow, but can we include anything we want if we are the manufacturer? What if our “manufacturer’s packaging is just a poly bag and we want to include a product insert that directs people off Amazon. Is it a problem if it’s visible through the poly bag? As far as I know you can include information that supports the product. If you are unsure…you may wan to contact seller central support. just curious if you are able to ask for a review on the insert card. does this violate any of amazons policies? I don’t think it does, but be careful how you say it. If you say you want an honest review…I don’t see it being an issue. What are your thoughts on including a registration URL on one of the opening emails to them? Perhaps it could be at the very bottom on the initial welcome email ( perhaps as a P.S. or P.S.S) . I was thinking that this could either eliminate the need for a registration card or maybe both can be done to collect more emails. I would advise away from this. Amazon says no external websites in emails. Please help me with one question: is ok from Amazon point of view to put website URL visible on cartboard on you poly -bag, or hide that in the packaging instead? What is your thinking about that? All I can do is tell you what I’ve done. It’s still unclear what is ok by Amazon. I put the link inside the package on the insert card with directions. It points to a registration page where they can receive warranty and more helpful guides. Great topic once again and good timing! I’m in the process of adding a URL to my product label to send traffic to a squeeze page to collect email addresses. What would you estimate the cost of the tools you use to accomplish this that you mention? Fiverr is a great resource to have the insert cards designed. Scott, I greatly enjoy your show and have listened to every episode. I’m assuming you’ve limited your $5 off coupon on Amazon to a one time use per customer. Are you concerned that someone might publish the code online and you’ll get massive hits on it? (Or is this a good thing!?!) Also Amazon makes unique one-time use codes for to use, but I don’t know how you would insert these codes into an email. Actually, no I didn’t. It’s a code that doesn’t expire. It is good for anytime. You would have to purchase at full price to receive the discount. In the end…it’s a sale.